The University of Connecticut commissioned a fuel cell power plant on its Depot Campus in April, 2012, that will supply the campus with clean and efficient energy, cooling, and heating for years to come. The installation of a UTC Power PureCell system is one of many steps made by UConn to reduce its carbon footprint and build a sustainable community. 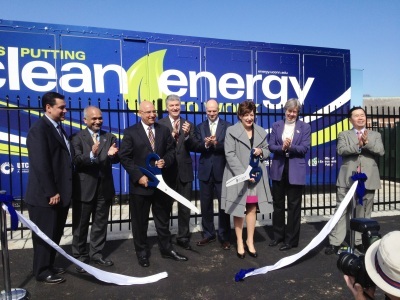 The fuel cell installation was made possible through a federal stimulus grant from Connecticut's Clean Energy Finance and Investment Authority. The 400kW fuel cell will provide energy to UConn's research labs and offices, including those working on advancing fuel cell and microgrid technology at UConn's Center for Clean Energy Engineering. The PureCell system is an energy delivery solution that combines hydrogen fuel and oxygen from the air electrochemically (without combustion) to produce electricity, heat, and water. The new power plant will serve as a demonstration model and teaching tool for UConn students, helping them better understand the technology and benefits behind advanced microgrid energy systems that can deliver clean, reliable energy while protecting the environment. By generating and using power on-site with a PureCell system, UConn will prevent the release of more than 831 metric tons of carbon dioxide annually, which is the equivalent to planting more than 192 acres of trees. The reduction in nitrogen oxide emissions compared to a conventional power plant is equal to the environmental benefit of removing more than 110 cars from the road. In addition to the reduction in greenhouse gas emissions, the PureCell system saves nearly 3.9 million gallons of water each year. Click here to read the full article about the Fuel Cell from UConn Today. UConn is currently pursuing the creation of a Microgrid on Depot campus. The plan is currently undergoing the approval process and the technical feasibility evaluation was recently passed by the Department of Energy and Environmental Protection. The Microgrid proposal has also been given the formal support of the Town of Mansfield. In addition, the University of Connecticut was awarded a $2.14 million dollar grant as part of the Connecticut Department of Energy and Environmental Protection $18 million dollar Microgrid Pilot Program. This program was designed to research and document the effectiveness of microgrid energy systems in supporting and protecting critical needs systems during times of extended grid outages. With the implementation of the new microgrid system, the fuel cell would be able to function at full capacity even despite the grid outage. This will allow the University’s critical needs facilities (fire/emergency response, command center, data servers, etc.) to keep functioning when they are needed most. Overall this project will bolster the university’s emergency response capabilities while providing significant research benefits on the practicality and effectiveness of microgrid systems for the state of Connecticut. Beyond emergency response, the microgrid will harden UConn's energy infrastructure, modernize the state’s electric grid, promote renewable energy projects, and support energy efficiency in the state of Connecticut. 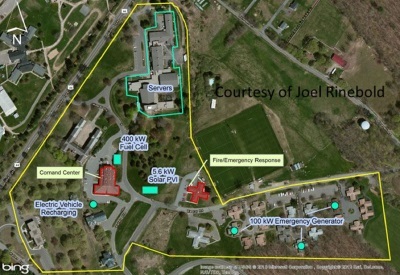 Click here to read about Microgrid Progress and Emergency Response from UConn Today.